My geek Xmas gift to myself was a Drobo FS . 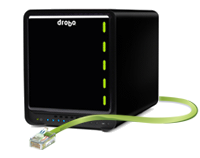 Drobo FS is a storage mount where you insert plain SATA hard disks. It’s biggest advantage is that it takes over the management or redundancy with your inserted disks and there is no need for you to configure replication redundancy like RAID etc. Your data is distributed across these disks but you don’t know that, you only see the device as one storage. When a hard disk fails, it notifies you, but it continues to work and you can replace the faulty device with a new one, without having to take any other actions. If you have inserted lots of disks, it can tolerate 2 simultaneous faults!